This is a long way off from finishing as I have only spun the heathered grey-brown Merino locks, but I thought I would show you my progress anyhow. Remember my day with my friend Diana, washing fleece and locks? 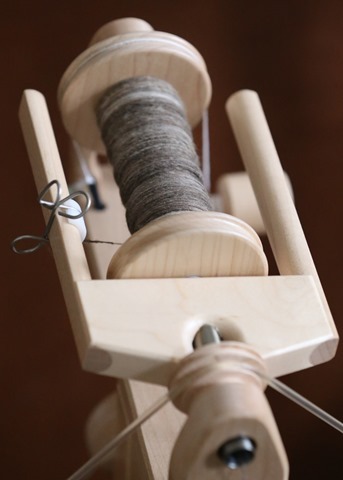 We had so much fun and I have been slowly making my way through the spinning of the Merino. My plan is actually for a fair isle toque, which will showcase the three natural colours of the Merino – the body will be the cream, then a small amount of the heathered grey and dark brown. I’m really excited to start charting out some ideas once I know my wraps per inch (WPI) and gauge. Merino always wants to be spun fine. It is a fine wool with lots of crimp. I flick carded the tips of each lock to open them up, then hand combed a bunch of little nests. I spun from the tip each time so this was a true worsted preparation. I let the singles settle on the bobbin for a few weeks, which ended up being Tour de Fleece anyhow, and then plied from a centre pull ball. Finished bobbin on the Lendrum. Filled ~half the bobbin. 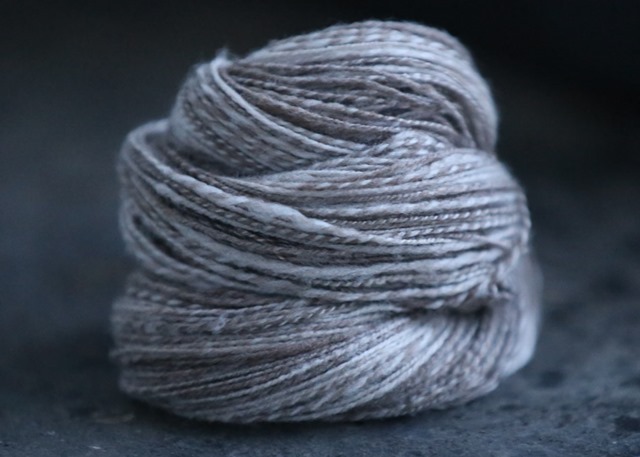 The finished yarn is very grey, with heathered light and dark spots. It is really a lovely soft yarn and there is still quite a bit of Lanolin in the wool. I’m going to wash this again and see if I can get some more of it out. I didn’t notice this particularly when spinning but the finished skein is a bit sticky. There are some very uneven parts in this yarn. I have to admit, I felt like a beginning spinner while spinning this fibre! It is super fine, wants to be spun fine as I said above and the faster ratios create a lot of twist. It was kind of a lot going on in my hands … but you know what? It is absolutely beautiful yarn. I’m looking forward to spinning more over the course of the next few months. Previous Post October SGY Fibre Club. Next Post about the house. This is lovely yarn. When we spun these in the Merino workshop, we snipped the tips of each lock, flick carded individual locks and spun from them. You get an amazing amount of spun yarn from just a handful of locks. BTW – if you want more, of any colour, just let me know and I’ll send them your way. Better you use them, than have them sit here. . . . . and sit here. 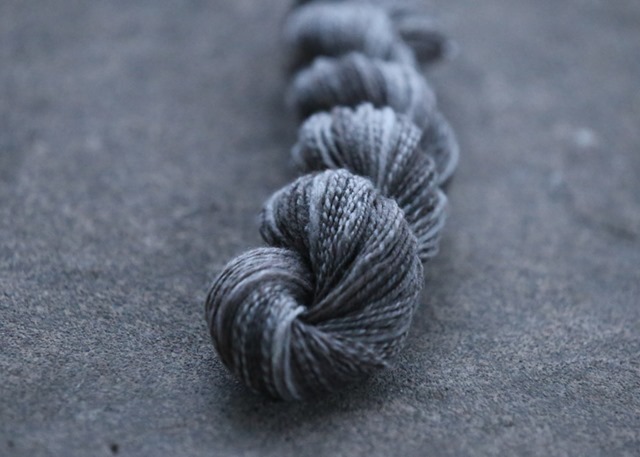 That is a really gorgeous skein! It turned out lovely! The subtle color variances are really charming. I bet the uneven bits will disappear into the knitting, no harm done. Call me crazy I like feel of lanolin in my spinning. My hands feel so soft while working with it. I have knit up a few hats with the lanolin infused yarn and they are very nice to wear when it is cold and wet. I am working on a sweater’s worth for a gansey. Hmm lanolin in a toque would actually be really helpful in our climate due to the rain … Maybe I’ll leave it and see how it is once knit up. Thanks for the thoughts! !